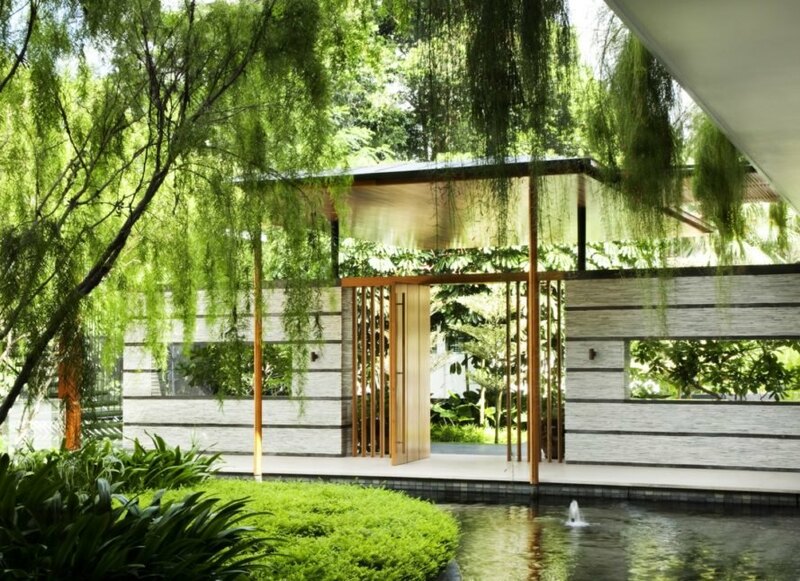 Whereas many modern buildings in Singapore rebel against the country’s tropical climate with air-conditioned, hermetic spaces, international architecture firm Guz Architects decided instead to embrace the natural environment in its design of the Willow House. The single-family home takes on a breezy, pavilion-like appearance with open and well-ventilated spaces that tap into passive design principles and crosswinds for cooling. Draped in climbing plants and organized around ponds and gardens, the home feels like an extension of its lush surroundings. Spanning nearly 900 square meters, the Willow House was completed in 2012 for a young couple with three small children. “The house aimed to create dynamic spaces that encourage play and interaction,” the architects said. 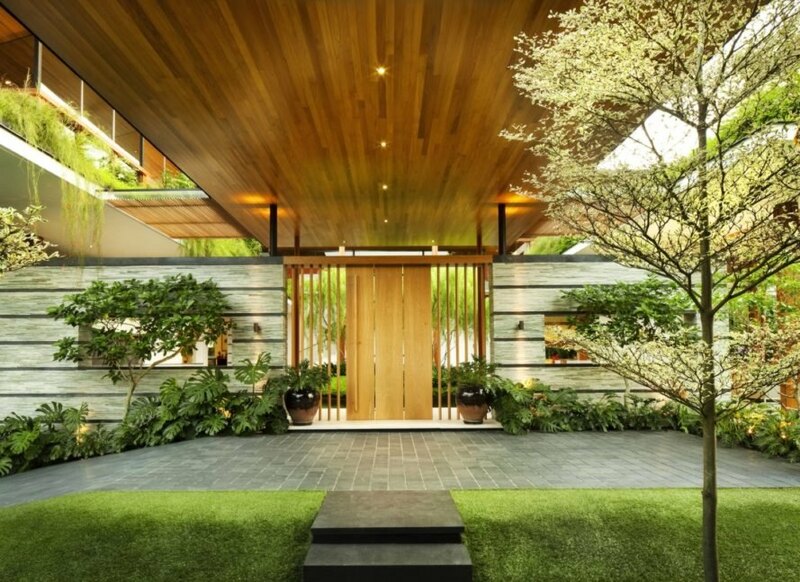 Surrounded by tall trees, the home is located in a private oasis of calm that looks a world apart from the dense urban environment for which Singapore is famous. 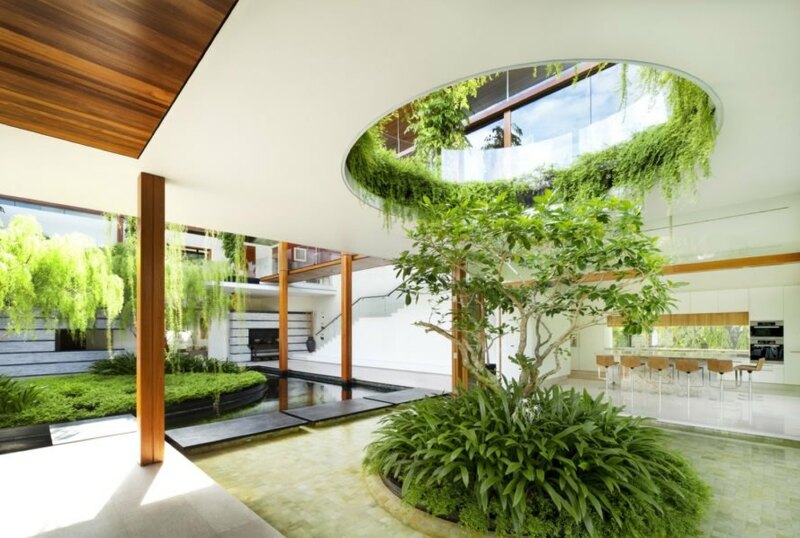 Oriented to optimize access to cooling breezes, the two-story residence is laid out in a L-shaped plan that wraps around a central courtyard with a pond. A single-story open veranda with an accessible rooftop garden anchors one side of the water courtyard and houses the primary living spaces. The other communal areas — such as the kitchen and dining room — as well as the concealed service areas are located on the ground floor, while the private areas are placed above on the first floor. The master bedroom and children’s bedrooms are placed on opposite sides of the first floor. A covered outdoor walkway on the first floor overlooks views of the roof garden and central courtyard, which comprises a large fishpond and a small island with trees. “The movement of water and fish brings life into the courtyard and draws the eye away from the building,” the architects said. 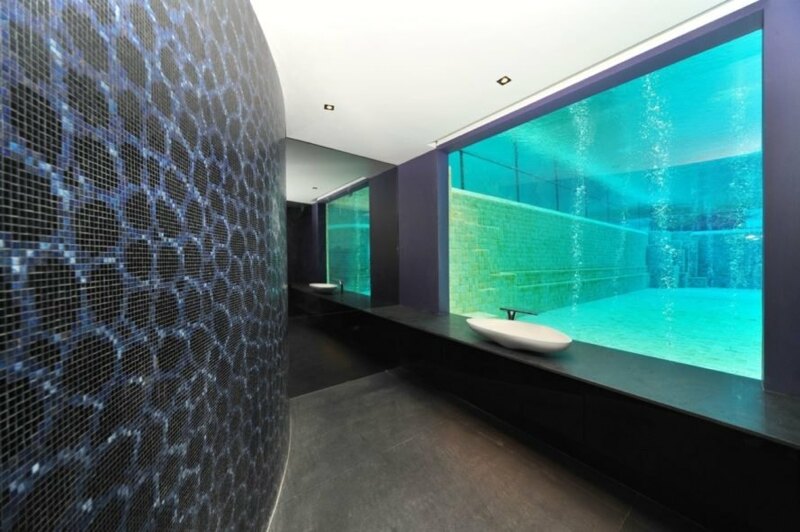 In the area between the veranda and kitchen, the fishpond transitions into a shallow freshwater reflecting pond and finally transforms into a 3-meter-deep swimming pool that mirrors the home’s L-shaped layout.